Carnival has been defined in many ways. The word has been used to describe a celebration of culture, an explosion of colour, and an expression of freedom in the guise of a festival. For the newest band on the block One World Rebellion or Rebellion for short - it's all that and more. The band is spearheaded by soca monarchs and recording artistes Fay-Ann Lyons and her husband, Bunji Garlin, out of the birthplace of carnival- the twin island Republic of Trinidad and Tobago. "Rebellion is something you feel. People tend to have an idea of what things should or should not have been, especially in the soca community, and I, for one, have been known to be rebellious to all the limits given to me," Lyons told The Gleaner. So just when Jamaicans thought that all band launches had ended this weekend, it continues on Saturday, December 8 with Rebellion's 'Revolt'. The theme, Lyons said, "is rooted in history and is based on the background of various cultural revolutions from the Africans to the American natives' fight for freedom ". The Feel Good soca songstress says that the name, along with the theme, was selected to create a true representation of the actual bringing together of cultures, sharing that it will be visible, especially in all of the eight costume and six T-shirts sections.
" It must have a core not just to function as another band on the road that means it needs to have a concept," she said. She revealed that one section is inspired by African countries, featuring a combination of traditional cloths and prints, while another has a feathered headdress instead of a feathered backpack to match the Mohawk Indians. The soca artiste is not new to costume creation, having garnered a lot of attention with her Atlanta for Fantasy section in this year's carnival in her home country. Why are Trinidadians having a band in Jamaica carnival? 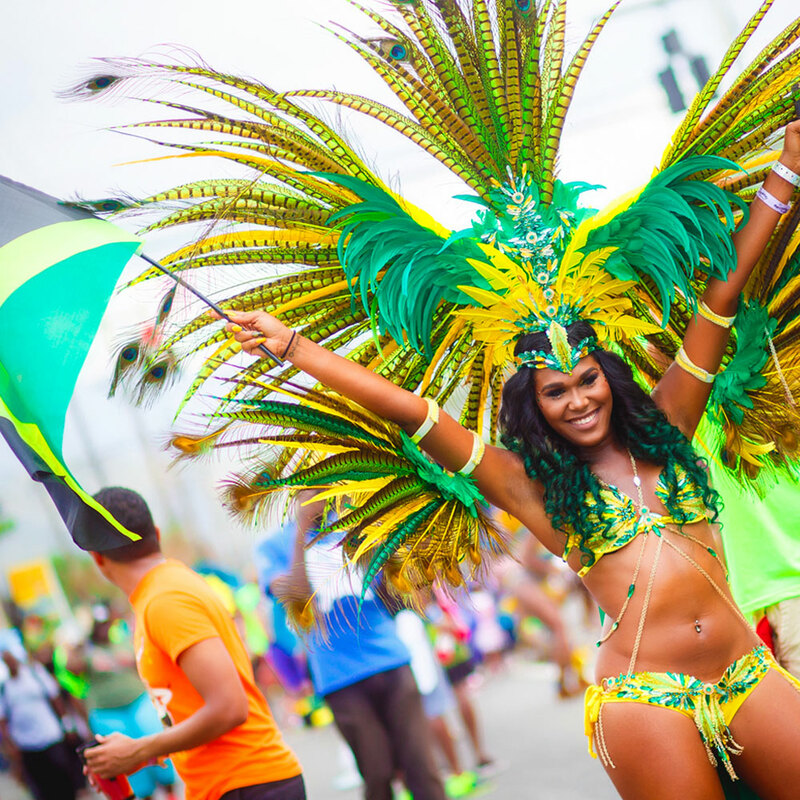 "It is a question and answer that may get me in trouble with my Trinidadian people, but facts is facts," she said before explaining that globally, people have become increasingly fascinated with the Road March experience in Jamaica. "People will ask, 'Are you going to Jamaica for carnival, too?' and I will be like, 'Yeah, I am going to be there' and the next thing you hear is 'OK, that means I don't need to go to Trinidad'. That should never happen. Any consideration for a toss-up should be for persons to go to Trinidad and if possible hit up Jamaica after," she said. She says that persons are becoming smarter with money and part of that decision making is choosing which carnival to play mass with. "Carnival enthusiasts are weighing the options against Trinidad because of, one, the accessibility, and two, a cost factor. Also, persons don't need to take two weeks of their lives to go to Jamaica for carnival because there are constant flights to and out of Jamaica. They can land Friday, party in the night then again on Saturday, and play mas on Sunday then go back home. The flights are affordable and run in a way that is convenient. You can, ultimately, stretch your money in Jamaica from transportation to hotel accommodations to food. The numbers are going to be crazy next year." One World Rebellion has partnered with Solid Agency and M7 Events (hosts of the popular SPF Weekend and Marbana) to get the band and the associated events off the ground. She added that her AzaFit brand would also be hosting a series of fitness classes in Jamaica throughout the Carnival season. "Right now, the team is constructing all the parts needed to make sure everything comes together fruitfully." While she could not give away all the enticing details all at once, she did hint at the possibility of collaborating with local artistes for on-the-road live performances. "The thing about us coming and bringing a product is that we do not have any clear expectations nor are we coming to dominate. The expectation is for our people to put on a good show," she ended.